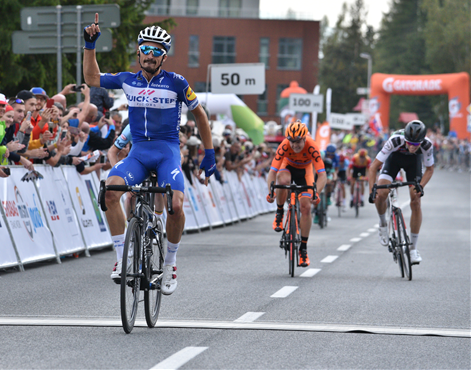 Quick-Step Floors made it two in a row at the five-day race, where Julian Alaphilippe – who is going ahead with his World Championships preparation – claimed a beautiful victory atop Strbske Pleso, twenty-four hours after teammate Bob Jungels powered to the win on the prologue held in Poprad, from where the race resumed on Thursday afternoon. Once the peloton left behind the picturesque town and headed for the High Tatra Mountains, Quick-Step Floors moved to the front with the experienced Iljo Keisse, who drove a steady pace behind the five escapees, who weren’t allowed to take their gap north of three minutes on the taxing parcours which included seven classified climbs. The final hour of racing included a circuit over the Strbske Pleso climb (7.3 kilometers, 4.9%), and on the first ascent the pack reeled in the escapees, before arriving all together at the base of the last hurdle, where the first attacks came some five kilometers from the top. Yellow jersey Bob Jungels expertly kept things under control, just as he did last week at the Tour of Britain, before Julian Alaphilippe made the decisive move and claimed his 11th victory of the year, one which took him at the top of the general classification at the Tour de Slovaquie. “First of all, I have to thank my teammates, who were perfect once again, controlling a stage that wasn’t easy at all. It poured with attacks in the closing kilometer, but I marked every single one of these and as I still had plenty left in the tank, kicked out with the finish line in sight. The yellow jersey came as a bonus, a beautiful one, and I would like to keep it until the end, but we must first see what tomorrow’s stage brings”, said after Quick-Step Floors’ 63rd victory of the season Julian Alaphilippe, who has an 11-second buffer over the next rider in the standings.